So sorry this is happening on a Friday instead of a Thursday, everyone! But, does it really matter what happened in this episode? I'm going to coin it the Red Dress episode. 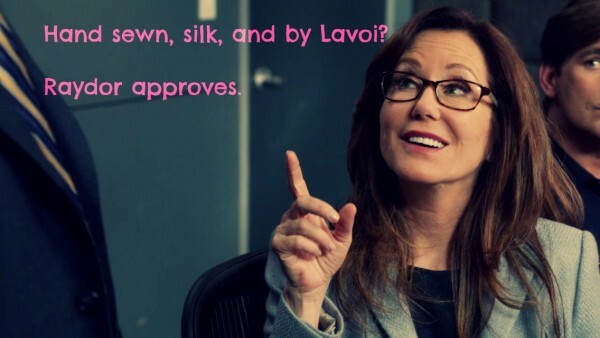 Raydor did what? One thing she definitely did not do was dress like your typical police captain, that's for sure! We love our Manolo wearing, rule following, lady in charge-and this week the woman rocked it. Delicate, pastel wearing Raydor from last week is gone-this week LaVoi put her in black and red in yet another great take on the classic "skirt-suit" look Raydor seems to love so much. 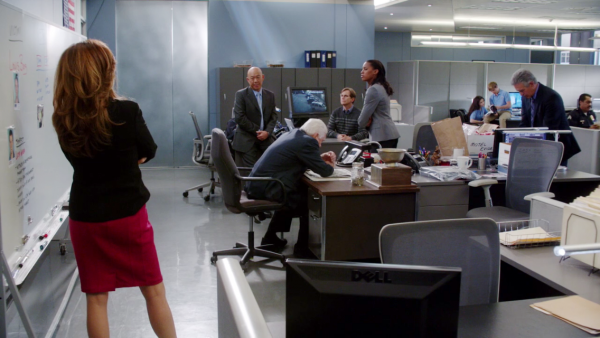 The seamed sheath dress is a funky alternative to Raydor's regular streamlined looks and adds a little variation to her usual style, while still staying true to the character's typical overall look. Fab-o job, LaVoi. 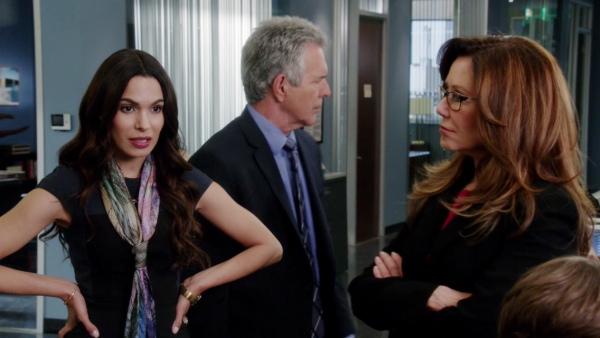 I love that he is really starting to develop her outside of what Brenda Leigh Johnson was, and Raydor is finding her way as part Fashionista, part Police Captain, part Mom. We've seen her in all three looks, and that's great! I enjoy that he paid homage to BLJ for a moment, but I am so glad Raydor is coming back into her own now as a character and as style icon. Red dresses are fun. They're fun to look at, they're fun to wear. Here are some options if you'd like one of your own! St. John Milano Cap Sleeve Dress -because we couldn't leave one of Raydor's favorite brands out! Dolce & Gabbana Sleeveless Lace Waist Sheath Dress- Okay, so maybe $1625.00 is a little pricey, but it's so pretty. 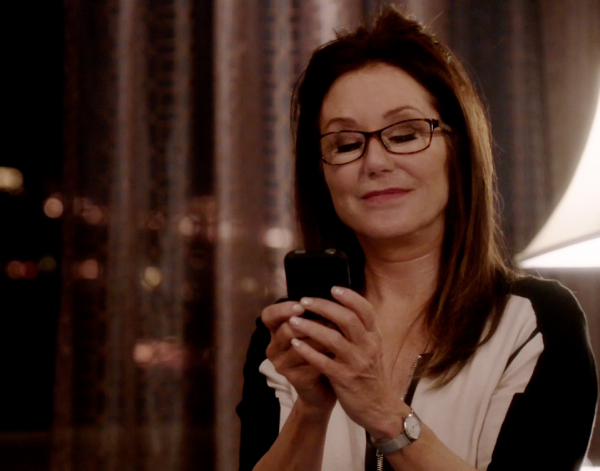 Can't you just see Sharon fawning over it in the window for a second while she's in NYC visiting her daughter? Kay Unger New York Seamed Sheath Dress- It's an interesting dress, and it has the seams like Sharon's does! Victoria's Secret 3/4 Sleeve Seamed Sheath Dress- I know I have recommended this before-but seriously...this is one of my go-to dresses, in both long and short sleeve. I love it. It's affordable, it fits well, it's comfortable, and it comes in every color you could want. Speaking of 'Part Mom' Sharon, did anyone notice yet another of Sharon's sweaters hanging on the coat rack behind her here? She seems to love sweaters as much as she loves Uggs-which is funny, given that she lives in one of the warmest states in the country! 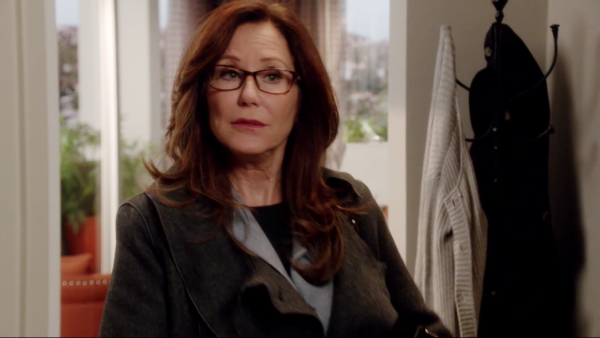 What do you think about this wardrobe choice for Raydor? Do you think it adds a fun element to her character that she comes home and puts her Uggs and sweaters on? How much do you think wardrobe adds to the depth of characters? And, of course, we can't forget his ugly ties! 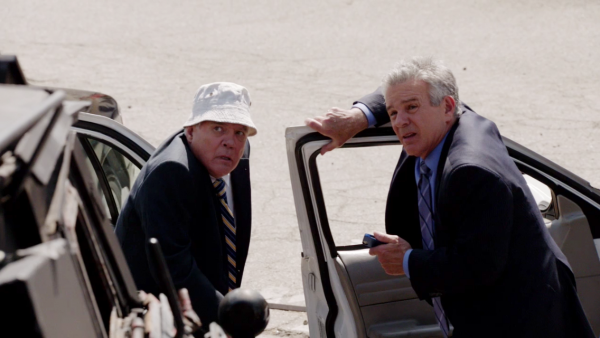 What goes through Provenza's head in the morning when he wakes up and thinks about what he's going to wear? Where did his ties come from? Grandchildren? Does he wear them because they remind him of the people who love him and bought them for him? Does he buy them himself and he's just a little hopeless in the fashion department? I mean, he does wear that hat. And why does Rios wear scarves every day, even though it's 90+ degrees in Los Angeles in the summertime? Does she do it because it adds a pop of color that still looks professional to what would otherwise be a neutral dress? Does she think it makes the dress look younger and more age appropriate while still allowing her to look like a professional woman? Is it a means of comfort and security for her to have something around her neck? What I would give to sit down for an hour with LaVoi and know his process and what questions he has the characters asking themselves when he dresses them! The truth is, what we wear everyday is such a huge part of who we are, but we often take for granted what we see our favorite characters in. So, again, I ask, how much do you think wardrobe influences a character? How much does it determine who they are? How much does it determine our investment in them? Does their dress play a part in whether we like them, what decisions we make about them, etc.? How would we think of Sharon if she came to work every day dressed in jeans and a sensible top or sweater or if she dressed in a less feminine way? Would we find her as intriguing, would we find her more approachable? Less likable? Would we feel differently about Emma if she dressed and looked less fashionable? Would she be a more sympathetic character if her clothes and hair weren't always impeccable? Sharon tends to wear one pair of diamond studs. Large diamond studs. A lot. I'm assuming they are one carat studs. You can find these several places, as well as crystal versions that aren't quite so expensive. Unfortunately it's hard to capture these in a still because our darling 'Sharon' actress, Mary McDonnell, has enough hair for ten women. Rios tends to wear the most noticeable jewelry, as you can see in the photo, but even her jewelry is still understated. Do you think the women on the show could afford to wear more or more noticeable jewelry, or do you like that, as police officers, they keep it practical and safe? Personally, I like that they air on the side of reality and keep the jewelry at a minimum! This totally isn't from Episode 2.04, but since we're doing accessories I thought I'd throw this in! Sharon's watch that she wears throughout the show appears to be the Skagen Klassik Women's Three-Hand Stainless Steel watch. You can purchase from the Skagen website, if you're so inclined. Skagen is a fun brand! I can't wait to read your replies! Glad that it's not being straighten within in inch of its life this season. Amen! I am so thankful that they've calmed down with the flat iron. She has gorgeous wavy hair, let it be!